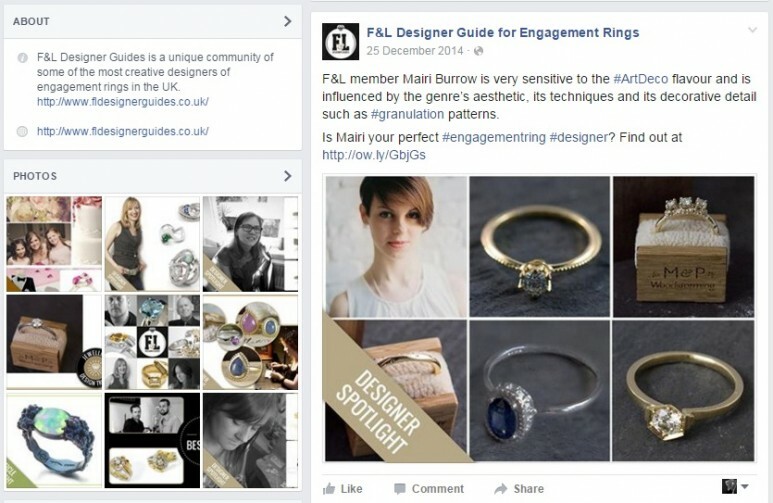 How we created our "Total Exposure" content marketing solution for the F&L Designer Guides to significantly boost exposure of top independent UK jewellery designers to more lucrative markets across multiple online platforms. 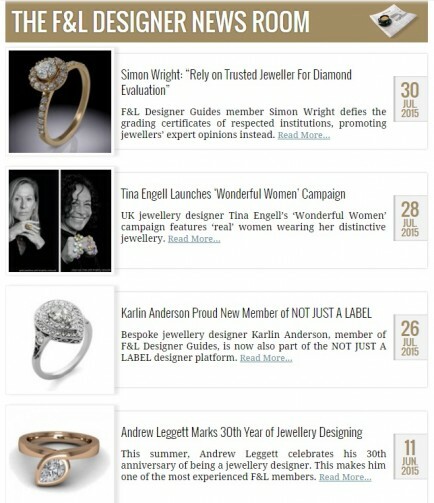 F&L Designer Guides is a unique community of some of the most creative designers of engagement rings in the UK. With joint marketing efforts, it aims to give Britain’s independent jewellery craftsmen the praise and exposure that they deserve. However, this community has remained relatively unknown due to low visibility in the marketplace. While their passion, talent and their creations are top-notch, like most independent craftspeople, these designers struggle to find the time or inclination for self-promotion. To help them achieve this objective, we decided upon a powerful strategy that relied on the concept of strength in numbers, combined with our vision of Total Exposure. This was a dedicated, concerted effort of showcasing and highlighting the designers’ amazing creations and then trumpeting these positive and inspiring messages across the internet. 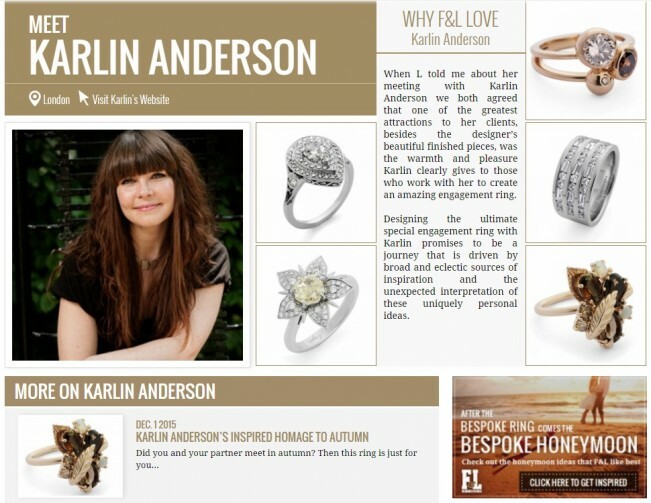 We created an online community of nearly four dozen bespoke and independent engagement ring designers and gave them one influential marketing springboard, which we proudly called F&L Designer Guides. The Profile: The foundation of the programme comprised a beautifully written and laid out profile page, which included information on each designer’s style, aesthetic, and sources of inspiration, along with photos showing off their most stunning pieces. Example of a designer’s profile page. Celebration Pieces: While the designer profiles focused primarily on the designers themselves, we needed to also create content that focused on their amazing bespoke engagement rings. We wrote up a series of articles and blog posts, each of which showcased and celebrated a remarkable creation by one of the designers. Over the period of one year, we wrote up many hundreds of these highlight articles, providing customers with a huge library of content and a massive showcase of designer rings to choose from. Intros of 3 celebration pieces. Clicking would lead users to the full article. News & Press: Even the best of our clients tend to struggle with news and PR, and this was true for the F&L designers too. So, in order to help spread the word even further for them, we created an inspiring news room and actually wrote their news for them. Every time they created a new design, attended an exhibition, were nominated for a prize, featured somewhere prominent – we were there, writing up a news story or press release and working hard to ensure that these news pieces received maximum exposure across the internet. The F&L Designer News Room is just one of the places where Press Releases are published. Social Media Content & Inspirations: While much of the content on websites and press sites is very formal and structured in nature (which is good for sales), we believed that we needed to augment and offset this with a strategic social media content programme. To this end we created a huge range of mix-and-match social content, in which our focus was to position the F&L community of designers in the very centre of the design world and the heart of the design community. Content included ideas and inspirations for ring designs, discussions about design trends, advice about choosing stones and settings, information about different colours and metals, and fun videos about proposing, wedding ideas and more. F&L Designer Guides’ Pinterest account is a good example of a place where “everything wedding and engagement” comes together. The next crucial step for the success of the project was to spread this smorgasbord of on-site, highlight, press and social content across the internet and put it in front of relevant audiences. We designed a multifaceted, integrated distribution strategy, in which each content platform intersected with and supported the others. For example, on-site profiles directed visitors to celebration pieces, and vice versa. We sent press releases to online press boards and articles to online magazines and industry blogs – platforms that all led traffic back to the F&L Designer Guides webpage. On social media, engaging content linked our followers to relevant on-site articles, designer profiles, and even our other social media platforms. The result of all of this cross-pollination was a cohesive and interdependent network of content. Each platform led naturally to the others, offering endless entry points for potential customers. An example of cross-linking from F&L’s Facebook page to F&L’s website. More entry points naturally mean greater exposure. As we expanded the breadth and depth of our content network, we exposed the designers to more and more viewers. The designers, which had formerly been nearly invisible in the marketplace, were now everywhere: in blogs, magazines, newsletters, and Twitter feeds across the internet. In addition to our own distribution and promotion efforts, we helped our designers help themselves. We gave all our content, written and graphic, to the designer members of F&L so that they could distribute it on their own business websites and social media accounts. This accomplished two objectives: it empowered our designers with content specific to them, and it added more entry points and connections in our content distribution network. Our intensive web content and social media programme achieved Total Exposure for an industry that desperately needed visibility and outreach. A simple but effective three-point system of content creation, content publication, and content promotion has proved successful across the board, with over 15,000 combined followers on F&L’s social media accounts. F&L’s successful exposure program has allowed its 46 members, all accomplished and talented bespoke engagement ring designers, to finally get the recognition and visibility they deserve. Need a Profitable Content Marketing Programme for your Brand? If you are interested in finding out more about how LeadGeneratorsDigital can build and manage a profitable Content Marketing programme for your business, please talk to us.